Lord waits for his dear devotee “Peria Nambi” during Rathayatra..
Swami Alavandar is universally considered to be the Acharyar of Sri Ramanujacharya, though he had never spoken once to Swami Ramanuja till he lived. Whatever he taught Ramanuja he did it only through his disciples. Alavandar’s disciples were priceless gems. Perianambi, Thirukoshtiyur Nambi, Thirumaalaiyaandan and Peria Thirumalai Nambi were the chief disciples. Of these Perianambi personally taught swami Ramanuja and it was Thirukoshtiyur Nambi who made swamy Ramanuja walk to his place 18 times to learn the meaning of LORD’S name. Alavandar had another disciple by name Maraneri Nambi. The other disciples were all high-caste Brahmans whereas Maraneri Nambi belonged to a caste which was in the lowest rung of the social ladder during those period.Alavandar did not discriminate between his disciples and he loved Maraneri Nambi more than the other disciples. Peria Nambi and Maraneri Nambi were of the same age. They became close friends. They would discuss their teacher’s words and each friend would contribute to the other’s learning. Once Alavandar was suffering from a painful disease called the carbuncle. Carbuncle, known as the King of Boils, Rajapilavai, in Tamil, is caused due to inflammation of tissues in the back and neck. The shooting pain emanating from the fast-spreading boil would be unbearable. Antibiotics and painkillers were unknown in those days and it is difficult for us even to imagine the kind of pain the disease inflicted on its victims. Swamy Alavandar was suffering silently. He did not even let his disciples know about the disease lest they should be worried. Perianambi and Thirukoshtiyur Nambi alone knew. One day Maraneri Nambi went to Alavandar’s house. He insisted that he should see his Guru. Alavandar was hesitant. But Maraneri was adamant. So he was let in. Alavandar tried to cover his pain and welcomed him with a smile. He thought that Maraneri had come there to clear his doubts in his lessons. The best way out was to dispose Maraneri as early as possible without letting him find out his disease. Maraneri came into the room and prostrated at his Acharya’s feet. “May you be blessed, Maraneri Nambi. Please get up. You see I have a lot of things to do today. “Today I have come to you with a desire. I have set my mind on that object. Maraneri ran out to fetch a silver vessel containing the holy water. “Yes, you are right. You want the mutt’s land near the river kaveri .Well, it’s yours. “Please repeat whatever I am going to say..
“What the hell you are doing Nambee ? This is not a game. This water is holy. And if I repeat whatever you said, then you will have the disease, you moron. Don’t ever say the words again. “You are one of the greatest Acharyas, the world has ever seen. You have promised to give whatever I want……. “But that’s ridiculous, Nambi.”“What is ridiculous, Acharya? You are our Guru. You have a hundred disciples. A thousand people come to you every day to listen to your words. Even the Lord who sleeps forever in the temple is looking forward to see you every day.“How can you afford to be confined to your bed? And by your kind, wise words you are removing our pains. Pains which have been following us for millions of births. How can you suffer in pain, Acharya? “I am a low-born worm, Gurudeva. By accepting me as your disciple you made a gift to me which is worth more than the whole universe. “Now, Gurudeva, please.. I beg of you.. please allow me to do my part. If you refuse to give your disease then I will have no option than to die at your feet. It’s your call.” Alavandar melted. He poured the water on his hand and chanted the appropriate mantra. Alavandar looked at his disciple through a screen of tears. Alavandar was happy and sad at the same time. Happy that he had such a loving disciple and sad because he was forced to give so much of pain and suffering to such a nice man. Maraneri Nambi went out as a happy man. Peria Nambi met him outside the room. “After many decades of discipleship it was only today that our Guru was kind enough to give me a precious prasadam. Perianambi did not understand a word of what his friend said. Alavandar’s recovery was quite dramatic after that day. A week later Maraneri Nambi was down with carbuncle. It is said that he suffered for three months from shooting pain. Whenever he was in pain he would only chant the name of his Gurudeva. Because his Guru’s blessings were fully on him and because the Lord was moved by his selfless love Maraneri Nambi recovered from the disease sooner than the usual time. Swamy Alavandar was more than a hundred years old. One day he passed away. Maraneri Nambi and Perianambi, who were in their eighties, cried a lot over the death of their loving Guru. Swamy Ramanujacharya then came to Srirangam and took over the reins of the Ashram. Maraneri Nambi was now in his death bed. He called his friend Perianambi one day and insisted that he should be left alone with his dear friend. “Perianambi, my dear friend, I have a fear. When I leave this body they would give this body to my relatives. I have quite a lot of them, no doubt. But most of them are drunkards and cheats. They would drink arrack, dance around my dead body and utter all profanities. “I am Swamy Alavandar’s disciple and I have been thinking only of my Guru and God all these years. “Giving my body to my relatives would be like giving the sacred ghee offered in the yagas to a street dog. My body in which my Guru and my Lord reside should not be humiliated by those crooks. ”Perianambi held his friend’s hands and assured him. “I will take care of that. Our Lord, our Guru and the new head, the loving Swamy Ramanuja will never let that happen. He died peacefully in his sleep that very night. When Perianambi heard of his friend’s death he came running to the Ashram. He supervised all the funeral arrangements himself. Perianambi who was born in the highest caste of Brahmans did the last rites himself and lit the funeral pyre. It was nothing short of a revolution in those days. How could somebody born in the highest of castes, somebody like Perianambi, do the last rites for someone born in the lowest of castes? It created a great furore.Many disciples of the mutt opposed Perianambi’s action. Perianambi was banned from the temple. He was not allowed to mingle with the people.And somebody took up the matter with Swamy Ramanuja. Now Perianambi was Ramanuja’s teacher. Ramanuja knew all about Perianambi’s love. He also knew about Maraneri Nambi’s devotion. After all Ramanuja was the man who stood on the top of the temple wall and revealed the most sacred secret to those born in the lowest of castes, in spite of his Guru’s warnings. Yet he wanted the other disciples to know about Peria Nambi and Maraneri Nambi. He summoned Perianambi to his presence and held a court martial. “Oh Worshipful Acharya, you have been charged with a very grave offense. That you did the last rites for a man born in the lowest of castes. You are a learned Brahman. “You know it is forbidden by the sasthras. And the punishment prescribed for such an act is total ex-communication. That is you can’t enter the temple, this mutt or any other Brahman’s house. Perianambi knew his disciple like the palm of his hand. He knew that the show was only for the gallery. He saw the disciples jeering at him. Normally a soft-spoken person that eighty year old man now roared like a lion, no like the lion-faced Lord Narasimha. 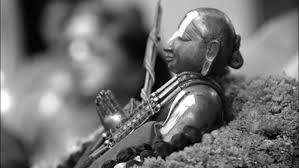 “Ramanuja, I have not done anything wrong. Do I have to remind you that in the great epic Ramayana our Lord Rama did the last rites for a bird, Jadayu? The arrow hit the bull’s eye. The lion-faced Lord had killed the demon called bigotry. Ramanuja clapped his hands like a child. He then turned to the other disciples. Well, they exactly did not have an argument against Perianambi’s powerful example. At the same time they were not large-hearted enough to condone Perianambi’s excesses. If he went to the temple the priests would leave the place. 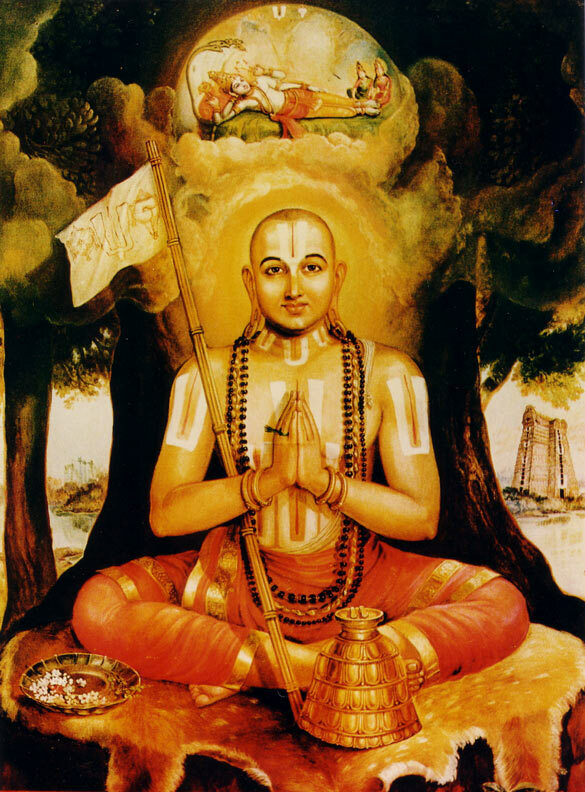 If any Brahman saw him on the road he would turn his face the other side and walk away…..
Swamy Ramanuja came to know of the ill-treatment meted out to Perianambi. After teaching love for years and years, these people still acted like fanatics. Ramanuja ran to the temple. It was late in the night. They were about to close the doors. They were waiting for the Acharya to finish his darshan. Ramanuja was sobbing before the sleeping Lord. “I tried my best to make them understand Perianambi’s love. Please, Lord, you will have to do something about it. “Please don’t let Perianambi suffer for his greatest act of love. 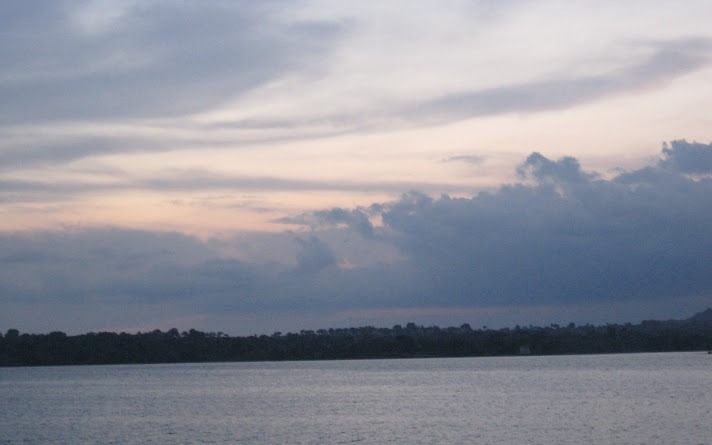 ”The Lord who is nothing but Love, the Lord who even while sleeping on the banks of Cauvery is constantly thinking about his devotees, the Lord who cannot tolerate any kind of bigotry, just smiled. He had already made up his mind to teach a lesson to those fanatics. It was festival time in Srirangam. The very next day was the famous car festival. 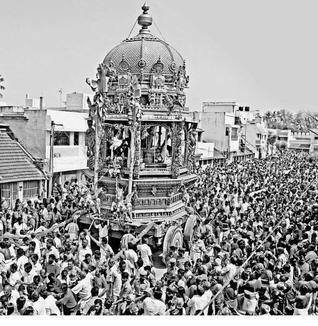 The huge Ther (car) of Srirangam was to pass through the house of Perianambi. When the Lord’s Ther came into the street Perianambi was sitting in his pooja room with all the sadness in his face. He had never missed the car festival in the past. Because he was a well-learned Brahman and one of Alavandar’s disciples, the car would stop at the gate of his house so that he could have dharshan. But this time it was different. He was not allowed in the temple. And nobody talked to him. He also knew that the Lord’s car would not stop in front of his house, this time. His eyes were shedding tears of love…..
“My Lord, do you also think that what I did was wrong? Maraneri Nambi is a much better person than I. And I am really proud that I had the blessing to light his funeral pyre. “If you have also decided to let me down, Oh My, dear, dear Lord, so be it. If you let me down, I don’t want anybody else to save me. Do whatever you wish, my Lord.” The Car had just approached the house of Perianambi. When Azhagia Manavala Perumal seated in the car was right in front of Perianambi’s house-entrance the huge car suddenly came to a grinding halt.Actually the administrators had cunningly planned to make the car run at double the usual speed when they were crossing Perianambi’s house. But those petty minds were but small pieces of cotton in that large fire of love whose name was AzhagiaManavala Perumal. He had his say. And He always had his way.The gigantic Ther stopped before Perianambi’s house. It looked as if their roles had been reversed. For years and years Perianambi used to wait outside his house for the Lord. Today the Lord was waiting for him. The administrators thought it was a mechanical problem and could be corrected only if they applied more oil on the axis. Pots of oil were poured on the humongous axis. Yet the car would not move.They sent word to the nearby villages. Hundreds of people came to pull the car. The Lord did not even move a milli-metre.They sent word to the stable and six elephants were brought to pull the car. The Lord was adamant. They then went in search of mantrikas and astrologers.The Lord was waiting patiently at the gate of Perianambi’s house. Four hours had passed. Perianambi was crying in the pooja room. Nothing moved.The best of mantrikas was summoned. He came there, closed his eyes and went into a state of trance. After thirty minutes he woke up. “Idiots, you have hurt a good man, a noble soul. 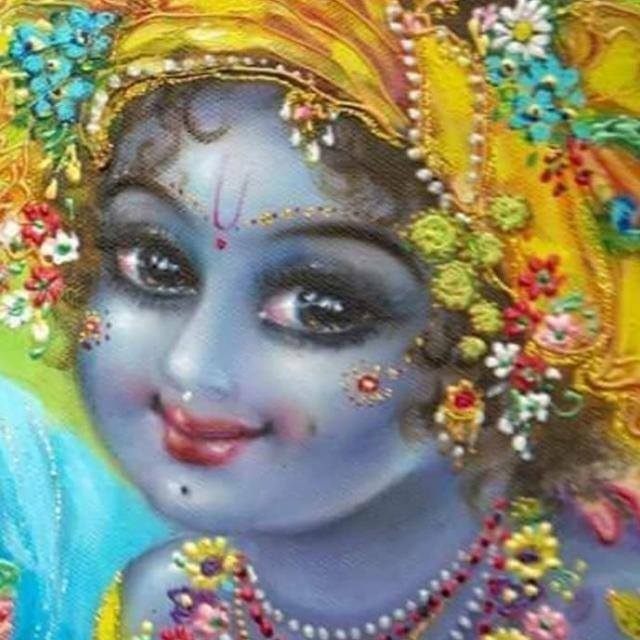 Unless you give Lord’s prasadam to him with due respects the Lord will not move an inch from this place. And fools, do remember this. If he thinks ill of you even for a second you’ll all be burnt to ashes in no time. You can even play with this God. He won’t mind. But never try to play with his devotees. You will be annihilated.Emboldened by their silence the mantrika delivered his punchline with aplomb.“You fools, if you have any sense still left in you, fall at Perianambi’s feet and beg his pardon. Unless he forgives you even this loving Lord will not forgive you. Mind it.”He refused to accept any fees from them. “I have a strong policy not to accept anything from sinners like you.” He ran away from the place. Then and only then they realized their mistake. The Chief Priest went into Perianambi’s house and fell at his feet. 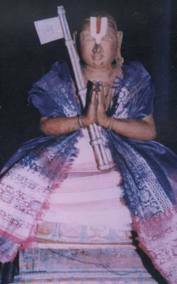 “Perianambi, our Lord, Azhakia Manavalar is waiting to see you. At your gate. Looks like He won’t move any further unless you come out and see him. ‘Please come with me and accept the Lord’s prasadam. And please forgive all of us. We are all petty-minded people. “We now know for sure that you are on our Lord’s side. No, no, our Lord is on your side. Please come, Peria Nambi. The Lord has been waiting for you for the past four hours.” Perianambi ran out of the house. It was a sight to see almost the entire town falling at his feet.He ignored them all and fell before the huge car. The Chief Priest lifted him up and honoured him with the Lord’s cloth and his sadari. A garland was taken from the Lord and was placed on Perianambi’s neck. 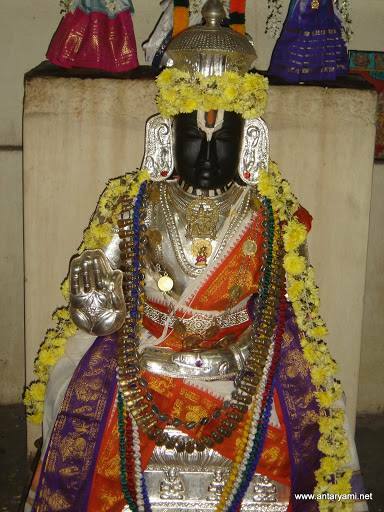 Azhagia Manavala Perumal was affectionately smiling at his devotee. Perianambi was respected like a King amongst his peers. For did not the Lord Himself stop at his place? 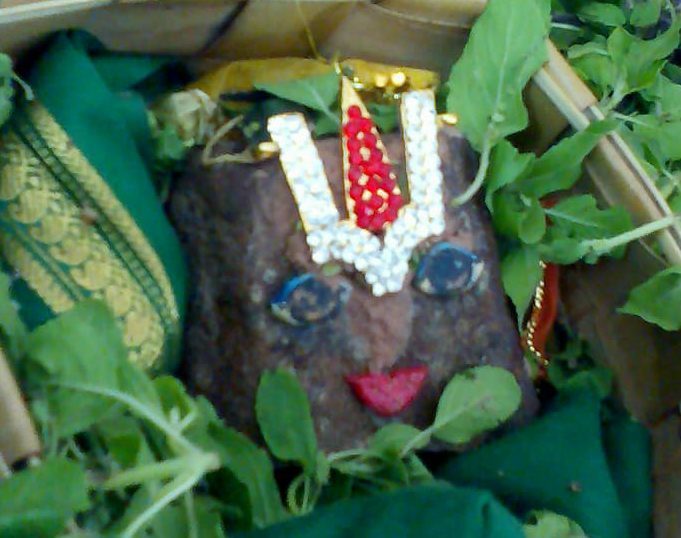 Seeing the bewitching smile on Azhakia Manavalar’s most beautiful face Peria Nambi folded his hands. He did not even attempt to control his sobs. “Any day your love is a million times better than mine, my Lord. Give me a billion births to be born as a worm to be crushed by the feet of your loving devotees. I can’t even repay a small fraction of your love. The Lord took leave of his devotee and resumed his onward journey. The huge car now moved as if its wheels were on air. 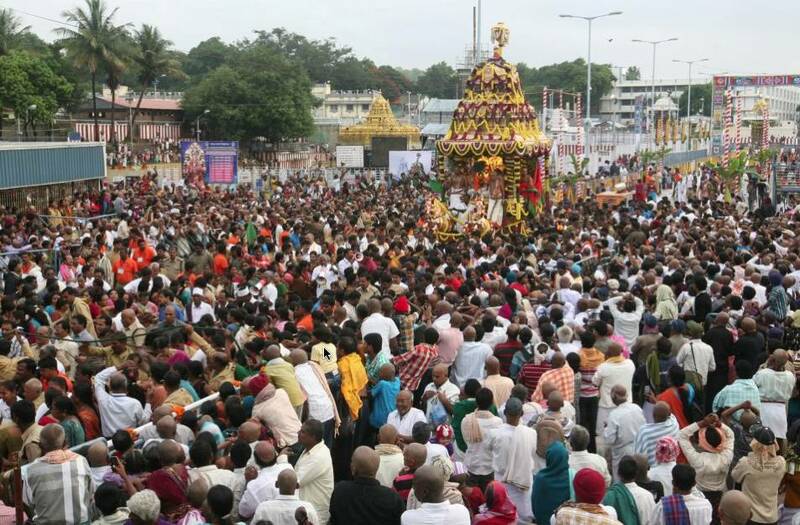 The gigantic Chariot started moving when less than fifty people gently pulled its ropes. Blessed to read this.wish everyone reads this. 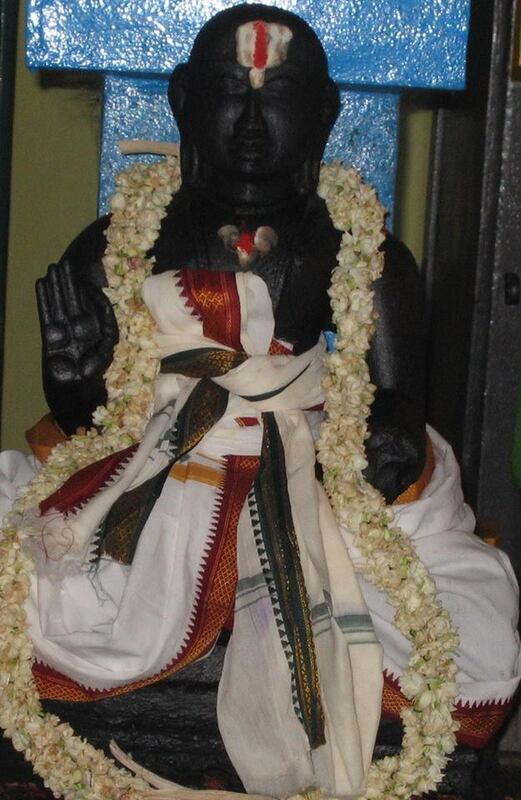 Sri Sottai Nambi ,the third son of Sri Alavandar, was the father of Periapiratti , mother of Sri Ramanuja.Asuri was the principal disciple of Kanva Maharishi who migrated to the banks of Kaveri and who was the author of kanva discension of shukla yujurveda taught by Sage yajnavalkya who was the author of a veda( shukla yajurveda), a upanishad( eshavasya upainashad) , subject of another upanishad ( Brihadaranya upanishad) , a bramhana ( shatha patha bramhana), yajna valkya smrithi , bruhud yoga manual.Father of yajna valkya was devaratha , son of Vishvamithra, and his maternal grand father was Mahidass Ithareya , author of Aithereya upanishad , first upanishad , part of Aithereya Aranyaka of Rig veda, his maternal uncle was vaishampayana who taught him krishna yajurveda and wanted it back due to some misunderstanding.He vomitted the teachings , picked up by four disciples , called thithiri( big sparrows in the forests), and the resultant upanishad was called Thaithereya upanishad.Discendents of Asuri carried the title ,Asuri.Incidentally , Krishna was called Asuri( refer Mahabharatha and Harivamsha).The father of Sri Ramanuja was called Asuri Kesavaji Somayaji, a expert in vedic rituals.Sri vaishnava teachings are based on antaryami portion of bruhadaarnya upanishad, theitheriya upanishad. The Great acharyans. By reading about these acharyans we are proud to be human-being. We will try to follow their words in life. Thanks for great postings. excellent information about our great acharyas. proud to be a Hindu. while reading this i had tears in my eyes lord ranganatha please give the same heart of periya nambi to all of us….. Lot of tears ….What a great Aacharyaas we got ! I was blessed Today !! Thanks for posting this. Excellent information about Alavandar, Mareneri Nambigal n Sri Ramanuja.